The morning programs are supplemented with enrichment opportunities included in the regular preschool day. Hebrew – Although Hebrew is part of our every day learning at Beth Meyer Preschool, we also offer a dedicated Hebrew curriculum once a week. Morah Limor visits each classroom and goes more in depth with the Hebrew language and alphabet through songs, movement games and letter recognition games. The aim is to familiarize the children with the language that they see and hear in the classrooms every day. Music – Moreh Josh comes directly into your child’s classroom every week with a wide assortment of songs and movement games that tie directly in with our integrated Jewish and Secular curriculum. Library – Once a month the children visit with Morah Rita in the building library for a dedicated story time. The children get to acquaint themselves with the idea of the library in a familiar setting and experience new and different books and songs with Morah Rita. 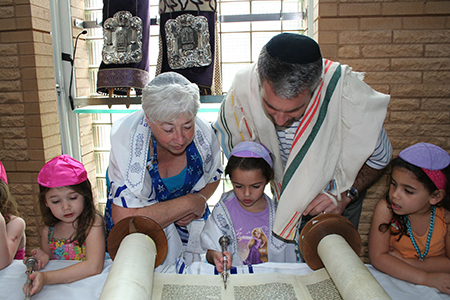 Shabbat Shira – Every week our children gather together as a school in the Beit Am to welcome the Shabbat with Rabbi Jenny. Storybook Theater – Led by Morah Betsy twice a moth for Dageem and Ariyot, this program builds concepts of theater through exercises and stories to promote self-confidence in a year-long curriculum. Yoga – Yoga is offered by Morah Rebecca. The program is designed to help children build strength, flexibility, concentration, balance and healthy body awareness. Creative Movement – This is a fun, gross motor and cognitive skills practice program. Children experience exciting stories, songs, games and colorful creative equipment.